You can create some good clue based poetry as treasure hunt riddles with some simple rules. Click here for Some Clue Ideas or see if you can Solve These Puzzles. What is the answer you are looking for, or what do you want the players to do – go to a location or find an object? If we wanted our adventurers to go to the STAIRS then this is an easy word to rhyme with. Think of another word that rhymes with stairs. We’ll use CHAIRS. We can mould that into a question. The key is the rhythm of the phrases and a missing word that clearly rhymes with the second line. The key is to come up with the two linking rhyming words first, like SING and THING and then work back from there. Keep saying the rhyme back to yourself as you write it to make sure it scans nicely. Take into account the abilities of the people attempting to solve your riddle. When you know the answer, it may seem a lot simpler to you than it is – try to make it a touch easier and if possible, test them out on an independent victim. The more effort that is put into the way the clues are written, the more participants will enjoy the experience. I need an idea I am giving my daughters Justin Bieber tickets to his concert #purpose tour I want to make it exciting as this is their Christmas gift any ideas on clues or something so they have fun opening the gift rather than just giving them the tickets clues or something to make it exciting…. Hello, I’m looking for a clue/riddle that has the answer ICE CREAM or ICE CREAM PARLOR. I plan to host a treasure hunt at a hotel/resort for my office colleagues. Any ideas how to go about it?? i would like a riddle to guess how many gum ball there are in a large glass jar. Hi…so many wondersful riddles are found here. I would love it..if you can help with my treasure hunt plan for my guy.I want difficult riddles for Gym, Best Friends house, Shopping mart, Lover’s residence. Hi I’m hosting a top-chef like treasure hunt. Well it’s not really a treasure hunt but in order for them to guess the ingredients of the recipe they’ll be assigned I thought I’d make a few riddles for each ingredient. For an event like this we would advise sealing the ingredients in boxes and hiding them, then giving clues as to their location. That way, they can cook with what they manage to successfully forage. You can then either do riddles for where you hide them, or make a simple treasure map. We are doing a treasure hunt downtown and wanted riddles to go to a bar for happy hour as the last stop, a riddle for a stop at the baseball stadium, a riddle to go to the museum. thanks ! Hi, for my husbands 30th im surprising him with a trip to New York (a month after his bday) wanting to buys 29 other silly gifts with riddles in between but want a good one for the new York? Any ideas? I’m making a ‘Who Stole the Tarts?’ Treasure Hunt for an Alice in Wonderland themed 18th birthday garden tea party, struggling to come up with themed clues linking to things in a garden, any help much appreciated! Cut out 12 parts of the Cheshire cat – eyes/smiles/ears, and just using the Hearts, stick a playing card to each bit and the game is to try to work out which one is missing. The first person to get the answer right gets a pack of cards. The remaining card is in the pack with the instructions written on of where the treasure is hidden. I need atleast 15 clues for I am conducting treasure hunt event in my college.These clues will be hidding within the campus.I need clues for computer lab,Parking,Canteen,Library etc. I need riddles for Refrigerator, Kitchen Table, Pillow, and Clothes Dryer. Thanks! I am hosting a scavenger hunt and need riddles that the answers contain an item that is red, is it possible for you to help me with that? hey give me a clue to reach hydraulics lab. Can you please give some more clues for garden and ground. Hi there… I would love some help creating riddles/rhymes for Park, my Bus Terminal, our local newspaper “The Royal Gazette”, a Birdcage and a 24/7 Gas Station. Thanks! This is a clue for a PARK. This is a clue for a BUS TERMINAL. The is a clue for The Royal Gazette. This is a clue for a BIRDCAGE. This is a clue for a GAS STATION. If you found this useful – please chuck a coin in the pot. . 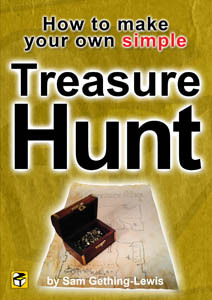 Here is a book on how to make your own simple treasure hunt! I want the riddles for the the same. Here is a treasure hunt clue for READING ROOM. Here is a treasure hunt clue for NOTICE BOARD. Here is a treasure hunt clue for INTERNET LAB. Here is a treasure hunt clue for PARKING AREA. Here is a treasure hunt clue for RECEPTION. Here is a treasure hunt clue for a SCIENCE LAB. I need atleast 30 clues for I am conducting treasure hunt event in my college.These clues will be hidding within the campus.I need clues for Civil Lab,Parking,Canteen,Library etc. Have a look at our ideas for treasure hunt clues for a school. Here is a treasure hunt clue for a PIANO. I need a riddle that mean look under your pillow for my moms Christmas Day scavenger hunt! Im trying to find riddle for the show Priscilla Queen of the Desert and also little clues I would place in the house to find the tickets in the christmas tree. Please are you able to help me? The word PRISCILLA will give it away, so split it up into 3. Hi… I’m hosting a winter party for 5th graders in their classroom. I need two sets of 10 rhyming riddles that they must follow around the classroom to the final destination of a candy cane box. Objects around classroom are: teacher’s desk, sink, white board, book shelves, student desks & chairs, computer, ipad charging station. Please help! Get them to solve simple anagrams by placing some tubs visibly around the room, containing loose letters (i.e. F H L S E for shelf). Tell them to shake the tub when they’ve worked it out to muddle up the letters again. I need a riddle that is somewhat difficult for my 32 year old son. The answer to the riddle should be a Nook HD. This is his Christmas present and he always guesses what he has before he opens the gift. So, I would like to put the riddles in a box and have him solve them to get the gift. In fact, I would like a couple of riddles leading up to the final riddle in which the answer would be the Nook HD. Get two small boxes smaller than the final thing and tell him it is an anagram. In the first, put the letters, from a game like Scrabble, for HOOK and the second ND. That should slow him down for a while! Here is a treasure hunt clue for an OFFICE. I need a riddle or rhyme to invite my coworkers to play a “Baby Photo Guessing Game” and “Family feud” style game at our annual holiday party. pease help!! Then we must have a Family Feud! Hi! Can you help me with a clue for email? Not amail, bmail, cmail, dmail or fmail. Do not think out-box. When a ‘virtual’ man is a post but the other way around. I’m organizing a treasure hunt competition for the juniors in our college aged 18-19 yrs…..please help me out with some ideas for the riddles. To engage a clever bunch of young adults use the technology they have in their pockets – their phones… i.e. 5427279 would spell out LIBRARY or if they have QWERTY based smart phones use letters to the left of the real letter i.e. KUVELET is LIBRARY. My daughter is throwing a small end of the summer party with her friends and she wants to do a small scavenger hunt around the house and in the yard can you give my some ideas for rhyming riddles? You are good! I am so excited to throw my sons party!! Thank you for all your treasure hunting clues! Much appreciated! I need atleast 30 clues for I am conducting treasure hunt event in my college.These clues will be hidding within the campus. Take a look at these Treasure Hunt Clue Ideas and make a couple in each of those styles. If you have a long trail of clue locations and not much time, you can use anagrams. Tell people taking part, if any clues go missing – you’ll know who it was as they will be the only ones to finish! I am planning a treasure hunt for the youth of my church. I need the clues to be fun but challenging so the teams will be competitive.Can u give me some more riddles please? Here is a treasure hunt clue for a STAINED GLASS WINDOW. Here is a treasure hunt clue for a PEW. Here are some clues you could use around a SCHOOL.